Oil on stretched linen canvas with 3/4" staple-free edges - 8"x10"x3/4". 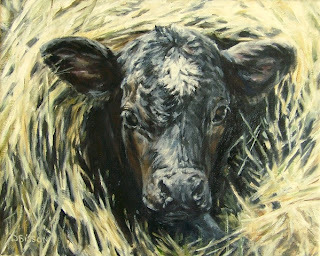 This is one of my favorite cow paintings from a few years ago with a calf looking out through a hole in a hay stack. I like the image of his dark face highlighted by the sun and the shapes of the hay surrounding it also.